HP is revamping its Spectre line of premium notebooks with a new thin-and-light model that the company says will actually be the thinnest laptop on the market. The 2016 HP Spectre measures just 10.4mm (0.41 inches) thick, making it about a tenth of an inch thinner than an Apple MacBook. 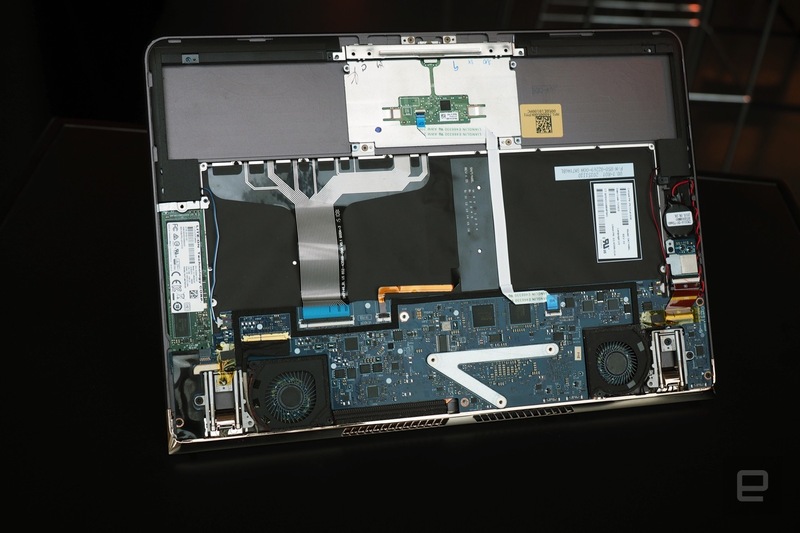 But while the MacBook has a low-power Intel Core M processor and fanless design, HP actually managed to cram an Intel Core i Skylake processor and an active cooling system into its ultrathin notebook. The new HP Spectre notebook should be available in May for $1170 and up. The laptop has a 13.3 inch, 1920 x 1080 pixel, 300-nit, IPS display with 72% color gamut, 8GB of RAM, and 256GB of PCIe solid state storage. $1170 gets you a model with a Core i5-6200U processor, and HP will also offer a $1250 model with a Core i7-6500U chip. There are also plans to offer models with 512GB of storage. Unfortunately the memory and storage are not user upgradeable: in the interests of making a laptop that’s as thin as possible, HP designed a case that’s sleek but difficult to open. There’s no fan or heat sink on top of the CPU. Instead, there are two fans on the back of the laptop. One pulls air in, blows it over the CPU, and then the air is collected in a hyperbaric chamber and pushed out of the laptop by another fan. The display assembly is just 2mm thick, thanks to 0.4mm Gorilla Glass 4 and CNC machined aluminum. HP’s 4-cell. 38 Whr battery is spread out to fill as much space as possible under the keyboard (although it does not take up space beneath the etched glass touchpad, because HP wanted room for a full-travel touchpad). The keyboard has 1.3mm of travel, down from 1.5mm on some of the company’s other portable notebooks, but HP says the experience has been fine tuned for improved performance. There’s a recessed piston hinge which allows the display to open and close much like a cabinet. It’s designed to reduce the height of the laptop while still providing enough friction to hold the screen firmly in place at any angle. While the new HP Spectre is certainly one of the thinnest laptops in the world, it’s just a hair thinner than one that launched in 2013. And it’s definitely not the lightest laptop available in 2016. At 2.45 pounds, the HP Spectre weighs more than the 2.03 pound Apple MacBook, the 1.9 pound Samsung Notebook 9, or even the 2.2 pound LG Gram 15. That said, 2.45 pounds is certainly a respectable weight for a compact notebook, especially one that HP says should provide up to 9.5 hours of battery life. One of the reasons the company opted for a 1920 x 1080 pixel display rather than a higher-resolution panel is to help offer longer battery life (it takes more power to pump light to additional pixels). The laptop also has three USB Type-C ports on the back. You can charge the HP Spectre by connecting the power adapter to any of these ports, and you can also connect a display adapter to any of them. Two of the ports also support Thunderbolt 3 for higher-speed data transfers. The HP Spectre laptop has a carbon fiber bottom, aCNC machined aluminum chassis, copper accents, a backlit keyboard, and speakers on the sides of the keyboard with Bang & Olufsend sound. HP says the Spectre laptop should be available for pre-order starting April 25th and it will be available in Best Buy stores starting May 22nd. HP is also launching a few special edition models at the New York Times International Luxury Conference in France today. Made in partnership with designers J. Hannah and Tord Boontje, a small number of these designer-edition laptops will be auctoned off to raise money for charity. So if you like your laptops encrusted in gold, diamonds, and Swarovski Crystal… time to get your wallet out. Really nice design. Hope battery life is as good as they claim. I’m having a hard time understanding that cooling. I can see a heat pipe and a heatsink in this picture. Edit: Oh this is not the first time a company used it. The air circles inside the computer then gets pushed out instead of having a fan blowing into a heatsink only. Well done HP. It seems that there are trying really hard to build something that is distinctive and that consumers will actually want. My main concern for a device like this would be battery life. 38 Whr doesn’t sound like a lot for a core i5 (or i7). I’m surprised they are not offering a core m variant. This is a thermal problem in the making. At least they have fans though, unlike Apple who crammed full Intel Core into a machine without a fan, and then had throttling problems. “Look how wonderful Apple are for making it work without a fan” I heard people say, oblivious to the issues. The fact that Apple themselves switched to the slower fanless Core M the moment it appeared confirms the problems they had. Now, if they do this 15″ matte, no number pad and 16 GB… that’s the laptop I was looking for 2 years ago.